I’ve been transforming a lot of leftovers into new concoctions creations lately. This is because I have a strong aversion to throwing away perfectly good food and with only two people to cook for most of the time, there is a higher possibility of having to do just that– what with our crazy ever-changing schedules that often result in never making it home for dinner. When I can interest myself in finding a way to use leftovers, I must say, I usually come up with something interesting and delicious. Invariably it is also something we’ve not had before! My last post was about using lotus root and I mentioned that I served a lotus root stir fry with a creamy salmon and corn soup. So I thought I’d share what I did with you because it came out so hearty and delicious. The whole idea started because I had grilled two lovely pieces of salmon for dinner on Friday night which I intended to serve Saturday night. (I often have to cook ahead.) Saturday night came and went and we didn’t get home for dinner until very late and ended up eating some take out food. So Sunday I decided to flake the salmon off the skin. I easily did this by scraping the skin off with a fork. Next, I heated up a liter of vegetable stock. No, it wasn’t home made but sometimes it is very handy to have a good vegetable stock on hand for quickly creating something. One thing I would caution you about is to find a brand that does not have any sugar or cane juice in it. So many of the aseptic packages of soup and soup stock have sugar! You really have to read the label and don’t buy soup flavored with sugar. The other caution would be to get a vegetable stock that is not heavily flavored with squash. It’s fine if this is the flavor you’re looking for, but if you don’t want a basically “squash soup,” then find a stock without squash in it. Mine just had filtered water, carrots, onion, celery, salt and seasonings. In fact, just because you are my friend and I care very much what I recommend, I dug the box out of the garbage so I could tell you it was Imagine Natural Creations Organic Vegetable Cooking Stock. 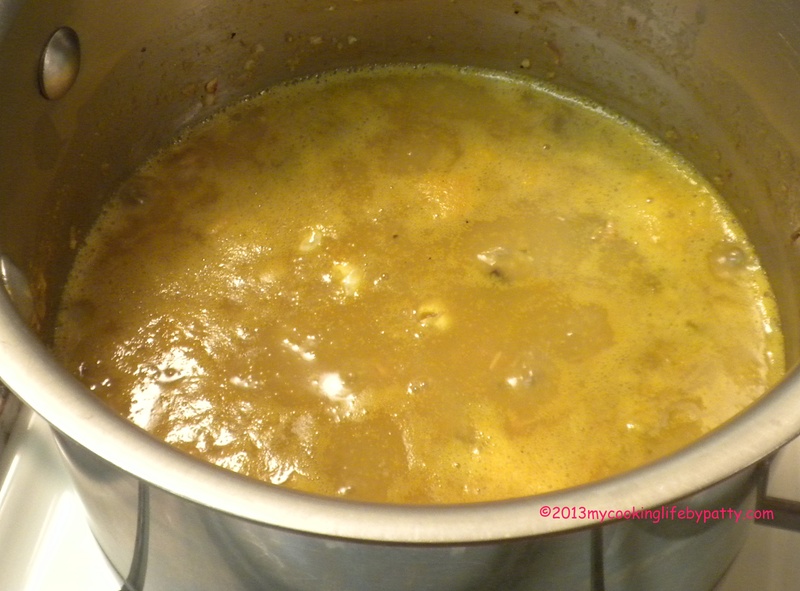 Put the stock in a 3-quart pot and add the corn meal grits and about a 1/2 teaspoon of sea salt. Stir the corn meal and stock constantly over a medium heat being careful not to let the corn meal sink to the bottom and burn. There are many things you can use to thicken a soup like this such as millet (I was out of millet), cous cous or rolled oats (didn’t want that flavor with the salmon) or soy milk (but that wouldn’t have been thick enough). The yellow corn meal worked very well with this because 1) I didn’t use too much and when it really cooked in I got the creamy-but-not-like-porridge consistency that I wanted and 2) the color was nice with the salmon. Once the corn meal and soup stock was softened and didn’t need constant attention, I added some leftover roasted garlic cloves. These were something I made for New Year’s Eve and it had kept very well in an airtight container in the fridge. I plopped these right into the thickening soup stock. If you don’t happen to have roasted garlic on hand, use fresh garlic only much, much less of it. I’d probably also add a dash of olive oil into the soup, too. Separately I diced the onions and celery and sauteed them in olive oil in a little cast iron frying pan. I used an immersible hand blender to churn up and smooth out the soup stock, corn meal and garlic. Then I added the sauteed veggies and the salmon. Throw in some organic frozen corn kernels. Use organic only here because then hopefully you are not adding genetically modified corn to your meal! Season with salt and pepper to taste. Garnish with parsley. I know this is uber-simple and probably you could come up with something of your own, perhaps with more herbs and seasonings. But it came out very, very well and was very satisfying. I was able to use my salmon, use the last of my roasted garlic and use the small 1/4 cup of corn meal grits I had sitting in my pantry. All around success I would say! I hope I have inspired you to use up what’s in your pantry and fridge. What have you created from leftovers lately? Do tell! This entry was posted in Cooking, Leftovers, Recipes and tagged Chowder, corn chowder, cornmeal, leftovers, salmon, Soup, soup stock by mycookinglifebypatty. Bookmark the permalink. I have a newborn and he is having problems lactose so breastfeeding I have to cut it out of my diet. smoked a whole half of salmon the other day and really wanted some salmon corn chowder but most have some dairy in so this is a great way to start. but I will add some bacon and potatoes to mine and old bay spice to thing of some adds I will do. thank you so much for the great recipe. That sounds very flavorful! Thanks Kendra! This looks delicious, Patty. What a good reminder to use corn grits to thicken a chowder like this. Have used them before, but keep forgetting. As for creating from leftovers lately, not much. Still following the detox diet so adhering to recipes for one of the first times in ages. Thanks Kathy! I checked out the link to that diet and it looks really excellent! I know what you mean about adhering to recipes – but that can be a good discipline and can lead to more creativity in the future.